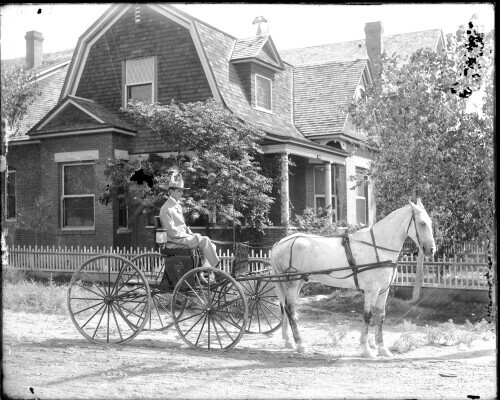 A man sitting in an early 20th century buggy. From its appearance, it seems that this was a Piano Box buggy. The piano Box buggy was named so because the main body of the buggy resembled a piano box. The exact location of where the photo was taken is unavailable. Shops and Businesses on 900 S Stanton Street in downtown El Paso. Autozone in view. Parked Bicycle with Shops in Background. A parked bicycle with shops and businesses in the background on 900 S Stanton Street in downtown El Paso. O' Reilly Auto Parts and other shops and businesses on 711 S Stanton Street in downtown El Paso. Clothing Shop on the corner of 700 S Stanton and E Father Rahm Avenue in downtown El Paso. 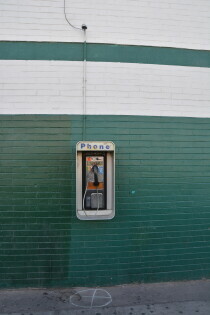 Pay telephone on building in downtown El Paso. Alley in downtown El Paso with dumpsters and vehicles. Chihuahua Sound on 316 E Father Rahm Avenue in downtown El Paso. Commuter bus station in downtown El Paso that provides transportation to and from Los Angeles, CA. 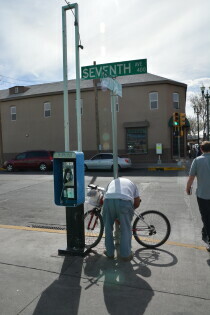 A street scene in Downtown El Paso. The picture was taken in 2014. 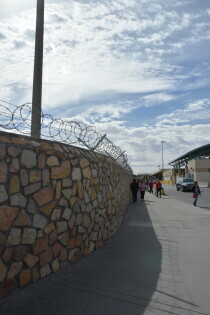 A street scene in Downtown El Paso, close to the border. The picture was taken in 2014.